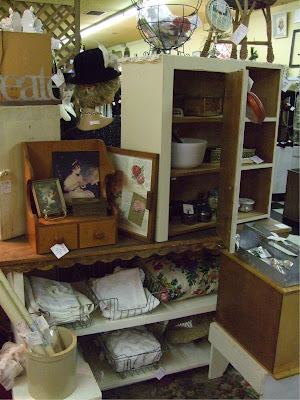 Last week I got a call saying I sold a big cabinet in my space at Splendid. Yeah! Unfortunately, we were just getting ready to head out of town for a couple days and I didn't have time to take anything over to fill the hole the cabinet left. I want to send a big thank you to my good friend, Mitzi, who kindly did a little booth clean up for me while I was gone. Fortunately, I did have the perfect replacement piece still riding around in the back of my car. 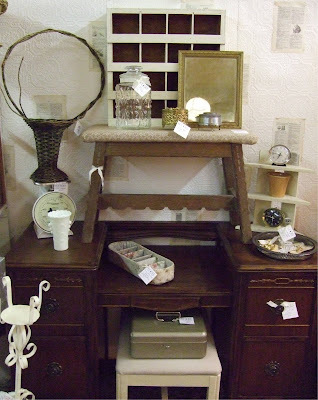 I found this awesome vintage vanity on one of my recent thrifting outings. All it needed was a little clean up and it was good to go. Thought I would show you some updated pictures of my booth. I think it's a little sparse right now as I haven't been doing much shopping the last month, but there are still some neat things that I have brought in recently. 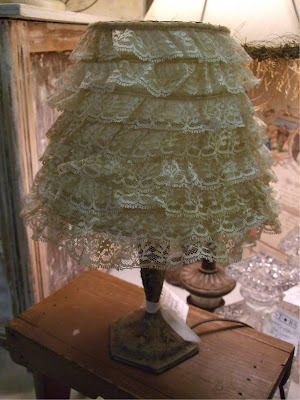 Here's a little lamp that I found last summer. I tried to sell it without a shade, but after awhile I brought it home and made this sweet shade to go with it. I just love how it turned out. And it was so simple too. It reminds me of a ballerina tutu. Here's what it looks like with the light on. If I had a place to put this cutie, I would definitely be keeping it. Another new item I have taken in recently is this vintage pin cushion. 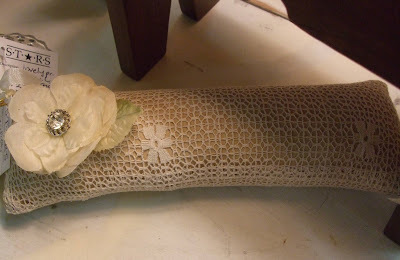 It had an boring muslin cover on it so I gave it a little makeover with some lace, a flower and a rhinestone button. Much nicer now. Yesterday, Isabel and I headed out early to visit our favorite monthly flea market. I had some Christmas money burning a hole in my pocket, so I was really excited to see what treasures I could find. 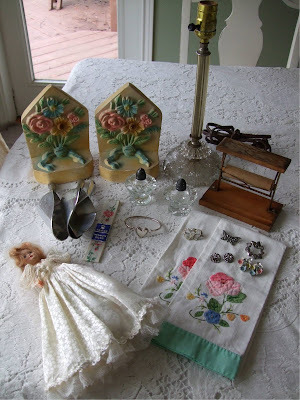 I am happy to say that the sale did not disappoint and both Isabel and I found lots of goodies to bring home. 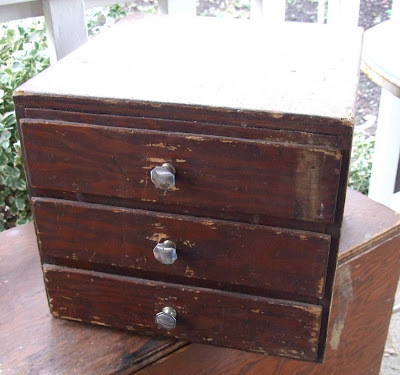 Cute, rustic box of drawers. 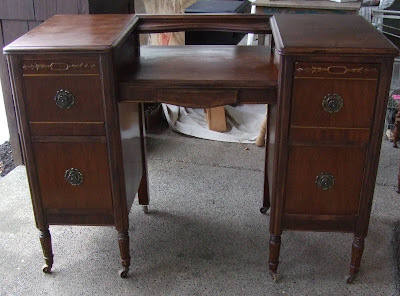 This will be getting a shabby chic treatment with paint and some sparkly glass knobs. 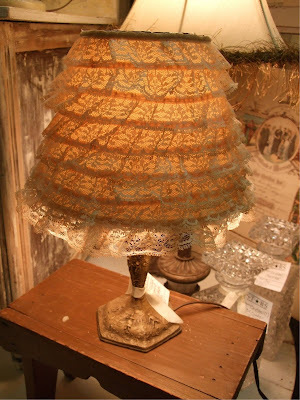 Vintage glass lamp, 3 metal scoops, bride doll, glass s & p, rose ribbon, misc. 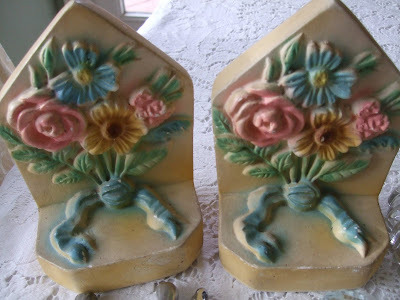 jewelry, chalk ware book ends, mini paper dispenser/cutter. 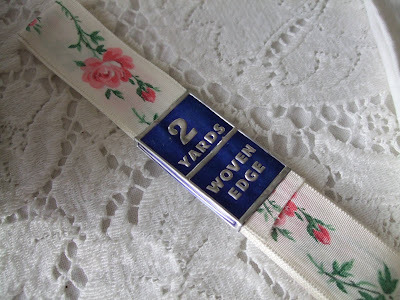 Close up of the lovely rose ribbon. Misc. 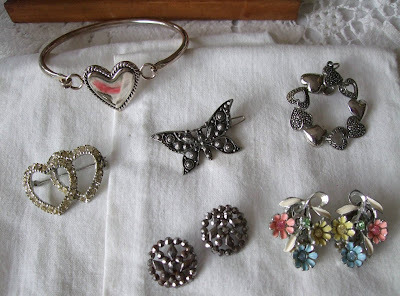 jewelry, buttons, hair clip. 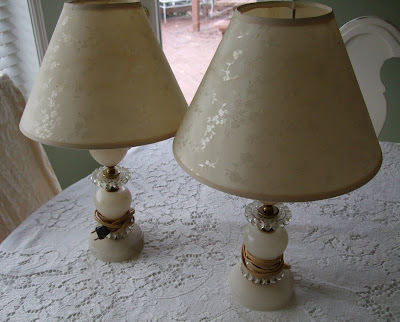 Pair of marble and glass vintage lamps plus shades. 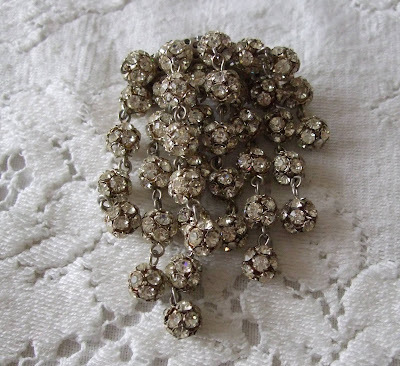 And finally, my splurge of the day, this multi rhinestone ball dangly pin. Love it! Are you still with me? I know this is a long post, but it's almost over, I promise. I just wanted to show you one last thing. My Christmas present to myself. 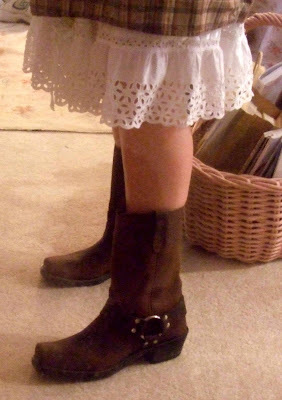 I have been wanting some of these boots for awhile now and since I had been a very good girl, I decided I should have them. I got them a couple weeks before Christmas and have worn them several times. They are great with skirts and dresses and are so comfy too. That's it for me today. I think I said something about another "Dreaming of Paris" post. I'll be back later this week with that. Love it all my friend! What a sweet friend you have! Now...that PIN is 2die4! LOVEEEEEEEEE it! 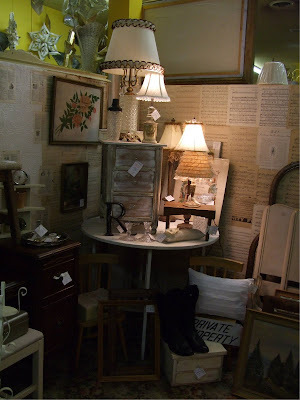 your booth looks great Lisa...i love how you prettied up the lamp and the pincushion...that is my favorite type of creating...foofing up and reinventing an existing object...love the boots!!! Okay I've spent my entire lottery winnings cruising round those pics (thats if I win the lottery LOL). I soooo want to go somewhere like that. There is nothing here at at. The monthly flea market you go to must be a great one. 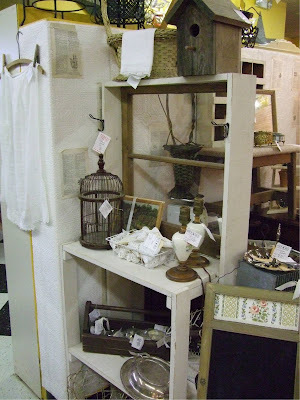 Love your finds and your booth looks good! Your booth really looks great. I just took all the Christmas stuff out of mine and I have to get busy. I like all your new treasures. That is a true friend. How lovely! I love all of your new loot and those boots are great! 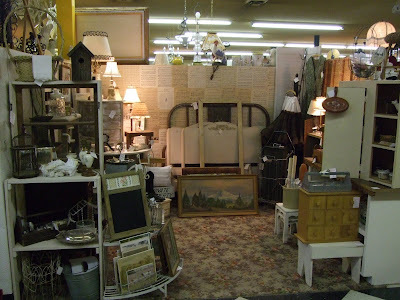 Oh - please share which flea market this is ! I would love to drive up and join you some day. I don't think the ones here in Eugene are that good. Darn. Lovely finds - thanks for sharing ! Looks great, I was thinking about the Flea Mkt on Sunday, but decided I better skip it this month. Glad you found some cool treasures. The lampshade is great. Wow, Lisa, lots of great stuff there!